The coffee-shop industry has been undergoing substantial change during the latter part of the twentieth and early part of the twenty-first century, reflected by continuous changes in consumer behaviour. The aim of this study is to improve the understanding of the motivational reasons behind customer choice in branded coffee shops, both international and local. A quantitative data collection of 300 questionnaires was used in the UK to assess consumer behaviour to branded coffee shops. The findings concluded that most respondents visit coffee shops with friends, with locally branded coffee shops the preferred choice. Consumer motivations to branded coffee shops are most influenced by three factors: past experience/ familiarity; convenience of location/travel; and friends and family. With friendly staff, high quality of coffee and food, good atmosphere and good reputation the most important aspects for branded coffee shops. Recent exposure of tax avoidance from companies such as Starbucks have had negative influence on consumer choice of branded coffee shops. Rapid developments and a monumental boom, the popularity of the contemporary coffee shop continues to grow in the twenty-first century. Starbucks entered the UK market in the 1990s (Bishop, 2012), which awakened a new era for branded coffee shops. Key Note (2012: 29) verifies that three major players exist; Costa, Starbucks and Caffé Nero, representing over 80% of branded coffee shops in the UK, confirming the power of international coffee brands. This major market penetration has been to the detriment of smaller, locally branded coffee shops, which struggle to compete (Bishop, 2012). However, some news articles suggest that locally branded coffee shops, e.g. Cadwaladers, can survive, using the power and competitive advantage of the local market. Recent exposure of tax avoidance (see 'Starbucks' paid just £8.6m UK tax in 14 years', BBC News 2012) questions the future influence of international coffee brands. From analysis of the above it may be inferred that local and international branded coffee shops divide opinion. Reviewing literature of brand concepts, it is evident branding has been widely addressed (Butcher, 2005; Caruana, 2002; Schuiling and Kapferer, 2004; Young and Rubicam, 2000), and more especially, branding in the hospitality industry, (Allegra Strategies Report, 2012; Bashaw, Brumm and Davis, 2008; Bell, 2008; Chathoth and Olsen, 2003; George and Stefanos, 1999; Hanson et al., 2009; Hyun and Kim, 2011; Kim et al., 2003; Kim and Kim, 2004, 2005; Kim, Ma and Kim, 2005; Kwun and Oh, 2004; O'Neill and Mattila, 2010; Ruddick, 2012; Ryu et al., 2008; Wanke, Hermann and Schaffner, 2007), though it finds little research specifically concerning branded coffee shops. Against the above background, the aim of this research is to improve understanding by providing an in-depth analysis of the motivational reasons behind customer choice in branded coffee shops, both local and international. This addresses the gap that exists within literature concerning branded coffee shops, especially regarding what factors influence customer behavior, perceptions and motivations to both local and international branded coffee shops in the UK. This review considers visitor motivation, theories of motivation in general, hospitality-specific and influential factors such as social influence, socio- demographics and branding, with particular focus on brand perceptions. Sharpley (2008) refers to motivation as a logical process that results from deep, psychological needs and motives or external forces and pressures; social relationships and lifestyle. Often unrecognised by an individual, it can kick-start the consumer decision-making process, to 'reflect an individual's private needs and wants' (Pearce, 2005: 51). However, Witt and Wright (1992) argue that needs and desires may arouse motivated behaviour, meaning behaviour is not necessarily predicted, whereas Fodness (1994) claims motivation is the driving force in interpreting an individual's behaviour. A range of research is related to tourism motivation or visitor motivation (Cooper et al., 2005; Dann, 1977, 1981; Eagles, 1992; Fodness, 1994; Iso- Ahola, 1982; Krippendorf, 1986; MacCannell, 1989; Mathieson and Wall, 1982; McIntosh and Goeldner, 1990; Mill and Morrison, 1985; Moutinho, 1987; Pearce and Caltabiana, 1983; Pearce, 2005; Sharpley, 2008; Sims, 2009; Urry, 1990; Witt and Wright, 1992; Wolf, 2002). However, very little research is related to coffee shop visitor motivations. Maslow's Hierarchy of Needs (1943), a theory of human motivation, provides a strong concept for consumer decision choice of branded coffee shops. Two constructs of this theory, i.e. 'love and belonging' support the desire to create a sense of connection. Witt and Bruce (1972) and Bearden and Etzel (1982), suggest individuals seek social approval, wanting to be 'liked' or 'be like' other individuals in society. The desire to achieve social security motivates individuals to choose the same brand as others, by external public observation or internal, social group attitudes. The power of the international brand as the 'place to be seen' creates a motivated behaviour choice. Lewis (2012) argues that superficial desires and behaviours are less influential factors and basic needs are more common-human. Maslow's concept of 'psychological needs,' the need for life basics, supports this alternative motivator, therefore the drive to satisfy thirst alone is another determinant for visiting a coffee shop. The study of needs provides a 'partial explanation of motivated behaviour' (Witt and Wright, 1992: 44), but according to Mill and Morrison (1985: 2) individuals are often unaware of the real reason for doing certain things, suggesting true motivations lie hidden in the subconscious. So other influential factors must be examined as reasons why people visit an international brand over a local branded coffee shop and vice-versa. Wolf (2006: 19) notes that 'nearly 100% of tourists dine out while travelling, and food and beverage consistently rank first in visitor spending', supported by Shenoy (2005). These findings suggest one explanation for the major growth of coffee shops in high-footfall leisure areas, with an increase in number of branded coffee shops to 3041 in the UK by 2009-10 (Bishop, 2012: 1). Tourist typologies provide tourist/visitor behaviour differences, e.g. Brand Seekers, Convenience Tourists, Culinary Tourists, etc. Hall and Mitchell's (2005) Taxonomy of Consumers can be used to classify the importance of food within their decision-making processes. Hall and Mitchell (2006: 147; Wolf, 2002) suggest a tourist may want to 'taste' the region they are visiting, with the culinary tourist (Shenoy, 2005), supporting motivated behaviour to a locally branded coffee shop. However, with many local coffee shops disappearing, this typology is questioned. Other influences like the power of a brand may alter ones attitudes and consequently change behaviour, research into brand power highlights this. Perceptions are influenced by motivational push factors, e.g. socio-demographics, familiarity, security, social norms, prestige and peer pressure (Swarbrooke and Horner, 1999). Ajzen's (1991) theory of planned behaviour examined how initial intentions and attitudes are affected by perceptions and account 'for considerable variance in actual behaviour' (Ajzen, 1991: 179). Moutinho (1987) suggests 4 sources of social influence; family, social class, culture and reference groups. He argued these internal and external pressures were detrimental to behaviour when exerted on individuals. Thornton (2001) supports family as a powerful influence in tourist motivation. Merton (1957) and Rossi's (1949) reference groups, describes the process when people adjust their attitudes and values to that of the reference group, e.g. product preferences (Burnkrant and Cousineau, 1975) and brand choice (Bourne, 1957; Stafford, 1966; Witt, 1969). Bruce (1970,1972) finds reference group influence can spread to other consumers explaining behaviour of visitors to a new area, seeking information when uncertain (Bearden and Etzel, 1982). Another example derives from the need to seek social status and social approval (Witt and Bruce, 1972). The term value- expressive, is the need for psychological association with a person or group, to the liking of the reference group (Bearden and Etzel, 1982) and 'need' to be identified as using the same brand 'publically consumed luxury' (Bourne, 1957: 219). French and Raven's (1959) propose 5 bases that explore how a social group derives power to exert influence. Socio-demographics also determine behavior (Bishop, 2012: 55), e.g. major coffee chains were more popular among men (29.4%) than women (20.6%) compared to independents in the UK. Additionally 54.6% of 20- to 24-year-olds were most likely to choose a branded chain compared to 17.7% of those aged 65 years and over (Key Note, 2012). Consumer research by NEMS UK Market Research on behalf of Key Note (2012: 1) claim during the recession 30.7% of people cut back on visiting coffee/sandwich shops, with, consumers more attracted by outlets offering discounts (Allegra Strategies, 2012). Mattila (2001) claims that social variables from the business perspective are critical for generating customer loyalty, e.g. social regard influenced new customers and perceived core service quality influenced existing customers (Butcher, 2005). Caruana (2002) recognises service qualities like customer satisfaction, results in service loyalty, while friendly behaviours in service interactions enhance business success (Bitner et al., 1990; Driver and Johnston, 2001; Hall, 1993; Iacobucci and Ostrom, 1993; Price and Arnould, 1999). Servicescape is also regarded as a critical factor. Wight (1996) argues the avoidance of crowds is important in explaining customer behaviour. For this research a brand differentiates the international service/product from a local service/product. The brand is a powerful tool that attracts positive consumer behaviour, influencing perceptions and choice, i.e. purchase intention. Wanke, Herrmann and Schaffner (2007) found that a brand name evokes specific associations, creating a brand perception e.g. 'Starbucks' - where 'star' may be interpreted as star quality and excellence, influencing consumers' link with quality (Ginden, 1993). Berry et al. (1988) suggests a well-chosen name creates a marketing advantage and should include key characteristics i.e. simple, flexible, memorable, distinctive and relevant - e.g. 'Costa'. Rooney (1995) suggests a brand name is a major asset, enhancing company success, generating consumer confidence (Assael, 1995) and active consumer behaviour (Assael, 1995; Meadows, 1983), as consumers perceive one brand as more desirable than its competitors (Rooney, 1995). Chernatony and Dall'Olmo Riley (1998: 426) identified twelve themes associated with defining a brand, e.g. shorthand, risk reducer, identity system and image, influencing the consumers mind. Memory shortcuts (Jacoby et al., 1977) help speedier decision-making, advantageous for the time pressed consumer. The recognisable brand becomes the favoured choice (Chevan, 1992), as a distinguishable international brand satisfies demand expectations (Chernatony and Dall'Olmo Riley, 2010; Montgomery and Wernerfelt, 1992), so a brand relationship is established that may explain international brand market dominance. Sweeney and Soutar (2001) suggest branded products have four consumption values that drive consumer purchase behaviour i.e. emotional, social, quality/performance and price/value for money. Explaining how one brand can differ from the next; international branded coffee shops may be perceived the best at delivering these values. The Customer-Based Brand Equity Model (Keller, 1993), conceptualises the idea that brand knowledge affects the consumer response, leading to a positive effect on consumer reactions, generating brand attitude (Tuominen, 1999; Yoo and Donthu, 2001). Research has explored how past experience has the ability to influence and change buyer behaviour (Busch, 1980; Gaski, 1984a; MacKenzie and Zaichkowsky, 1981). Research found that power can influence aspects such as satisfaction (Bachman, 1968; Bachman, Smith, and Slesinger, 1966), attraction (French and Raven, 1959), conformity (Warren, 1968, 1969), and social influence (Lippitt, Polansky, and Rosen, 1952). Crosno et al. 's (2009) 5 Base Social Power Theory adapted from French and Raven's (1959) original framework (appendix 1), found a brand wielding these concepts had a greater overall brand social power. These findings provide significant explanation to brand difference between international and local coffee shops. An investigation by Tsai (2011) strengthened the Strategic Management of Service Brand Relationships Model, finding service brand commitment and love, influence relationship e.g. satisfaction, self-concept connection and finally trust. Research on the importance of building and achieving brand equity, loyalty and awareness exist, yet little investigation into consumer decision of branded coffee shops. Literature suggests quality perception was most important for determining brand purchase (Bao et al., 2011; Grewal et al., 1998; Richardson, 1994, 1996). This provides support for research into customer perceptions of coffee brands and how they influence our behaviours. Schuiling and Kapferer (2004) argue with local brands' adaptability and better response to local needs, e.g. flexibility of pricing strategy for specific local markets highlighting a significant difference to international brands, which lack intimate relationships with local markets (Schuiling and Kapferer, 2004). Their research on the differences found that local brands have a higher level of awareness (85%) than international brands (73%) linked by the number of years local brands have been in the market (Schuiling and Kapferer, 2004: 105). Their database revealed other variables suggesting local brand advantages, for example, as being trustworthy, reliable, good value, high quality and traditional (Table 3 in Schuiling and Kapferer, 2004: 105). Local brands have the ability to create a brand value system (Chernatony and Dall'olmo Riley, 1998) by endorsing personal and cultural values (Engel, 1993; Reynolds and Gutman, 1988). Chernatony and Dall'olmo Riley (1998) argued that Brand Relationship and Brand Personality (Blackston, 1992) were important for repeat custom and strong bonding, e.g. Cadwaladers, a local Welsh example, provide 'distinct character' and 'culture' of its destination (Jones and Jenkins, 2002: 116) and help establish a more unique selling proposition (Haven-Tang and Jones, 2006). Evidence exists of community support for local brands to support, stimulate and revitalise local economy (Boyne, Hall and Williams, 2003), creating regional development (Hall, Kirkpatrick and Mitchell, 2005; Steinmetz, 2010) and preventing 'cloning' (Kelly, 2012). A case study by Patterson et al. (2010) highlights local brand power in Australia. Closing three quarters of Australian Starbucks, Australians continued to remain loyal the their own coffee brand Gloria Jeans. Schuiling and Kapferer (2004) support local brands as the leading competitor, arguing the qualities and traits of local business have proven superior. They conclude that cost is responsible for local disadvantage, with inability to generate economies of scale. Schuiling and Kapferer (2004) argue that international brand development benefits from global marketing, e.g. portfolio enhancement, compared to local brands who lack global status (see Daily Mail, 2009). Schuiling and Kapferer (2004) suggest a balanced mix of local and international brand development is key to entire industry success. The aim of this article is to improve our understanding by addressing the gap that exists within research and literature concerning branded coffee shops. Little research explores what factors influence customer behavior, perceptions and motivations to local and international branded coffee shops in the UK. Given the nature of the research, formal quantitative data collection using questionnaires was deployed. Target market analysis highlighted the most prominent influential factors, internal and external motives (Gnoth, 1997) and push and pull factors (Swarbrooke and Horner, 1999). This establishes what factors influence consumer perceptions, behaviour and purchase intention, similar to the survey conducted by Boa et al. (2011). Providing explanation as to why branded coffee shops (local/international) maintain their position within their industry, this research addresses the lack of research in this field, benefiting coffee shop businesses seeking competitive advantage or improvement. Providing insight to customer attitudes and perceptions, it proposes realistic prospects for brands, like the Y&R Brand Asset Valuator (Young and Rubicam, 2010). 'Surveys are, arguably, the most important source of information for tourism analysis, planning and decision making' (Smith, 1995: 42). Questionnaires are components of survey work (Finn et al., 2000), its purpose here is to obtain reliable and valid data on the research subject (Finn et al., 2000). A street survey of 300 questionnaires was undertaken, covering a cross- section of the community (Veal, 1992). Allowing generalisation of similar socio-demographic areas, this survey size gives representative data of the population (Seale, 2004), compensating lack of sufficient response data and weakness of randomness (Prentice et al., 1998), e.g. population and ecological validity (Finn et al., 2000). Clearly there is likely to be differences in demographics in the Southern cities/areas covered for this research compared to larger, major cities/areas across the UK such as London. Measures for the questionnaire are conceptualised from the secondary literature research, as discussed consultation of research literature like this facilitates internal validity (Finn et al., 2000). This identified deficiencies concerning consumer choice and behaviour to the branded coffee shop, reflecting research objectives for appropriate instrumentation and statistical treatment of data (Cohen et al., 2007). The questionnaire (appendix 2) included a standardised set of questions, allowing all respondents to interpret them in the same way, establishing standardisation and control (Finn et al., 2000). A pilot study identified improvements to the questionnaire before being confirmed as reliable, removing ambiguity or bias (Finn et al., 2000). Similarly to methodology by Bramwell (1998) and Prentice et al. (1998) this research was a non-probability sample of 300 shoppers, no sampling frame therefore is administered. Critics of this sampling argue that this method is weak, lacking randomness, approaching shoppers on an ad hoc basis (bias selection) inevitably means not everyone has an equal chance of being selected (Finn et al., 2000). To help overcome questionnaire distributer bias, a 'first to pass' system was used (Tourism and Recreation Research Unit, 1993). Shopping centres, high streets and small town centres in various locations in the South West (e.g. Plymouth, Taunton) and South Wales (e.g. Cardiff, Penarth and Chepstow) were identified as valid target areas, where street surveys are natural settings (Bogdan and Biklen, 1992; Cohen et al., 2007; Lincoln and Guba, 1985). The aim was to target up to 50% of shoppers within these fields (according to capacity of area). A total of 10 days was allocated for research collection, to reach a total of 300 responses. The procedure was validated and controlled by replicating each data-gathering activity, with the interviewer remaining neutral throughout the study, avoiding interviewer bias or the Halo Effect. Consent ensures content validity and reduces ethical implications (Cohen et al., 2007) while consequential validity was also confirmed; briefing participants their responses will not exceed the 'capability of the research' (Cohen et al., 2007: 140). This maximises interest and elicits a positive response rate (Brunt, 2012; Finn et al., 2000). The research method allows for completed questionnaires suitable for coding and analysis by SPSS, enabling the study to be easily replicated. Cross-tabulation examined results and chi-square tests 'measured how well the data fits the hypothesis' (Gravetter and Wallnau, 2009: 611) i.e. testing for goodness of fit, measuring what it is supposed to measure confirms validity (Finn et al, 2000: 28), creating a descriptive statistical account to interpret and generalise reality. Discussion reviews their linkages to the existing literature to determine if this new data supports or contradicts existing information. A large count for each gender was recorded, finding a higher degree of female respondents (55.7%). Their ages varied, with a large segment of the sample aged between 15 and 24 (42.3%). 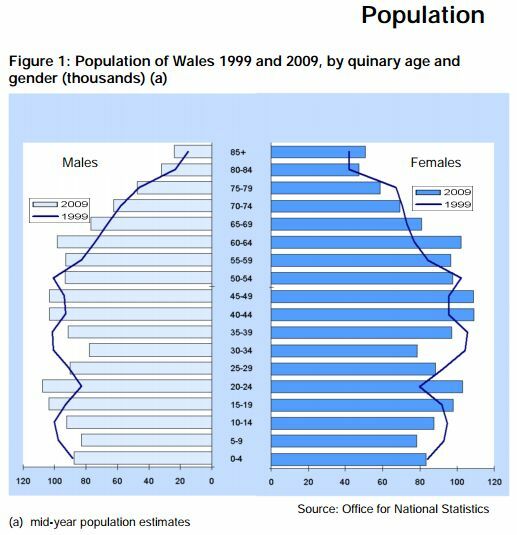 The population of England is larger than Wales. Results from the 2011 census (Office for National Statistics, 2011) reveal that England has 53.0 million residents, compared to 3.1 million in Wales. Further reporting that 'there were 27.6 million men and 28.5 million women in the two countries' (Office for National Statistics, 2011: 4). 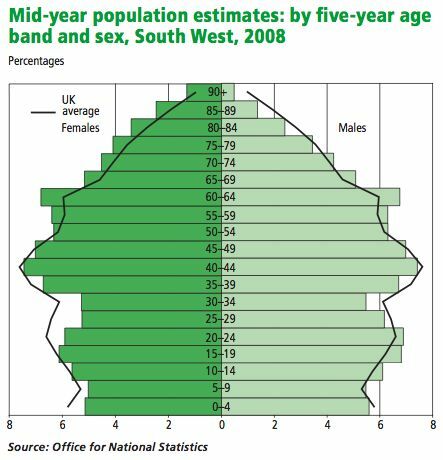 Looking more specifically at the UK regions used for this research, the South West and Wales, a marginal population difference exits between these two regions (see table 6). However closer examination of the gender populations of these two regions are fairly similar (see tables 7 and 8), both regions see more females than males for people living to an older age. These statistics support findings regarding the higher female count found in this research. highest (48.7%) followed by 'often' visits (31.7%). These findings support Wolf (2006) and Shenoy (2005), demonstrating that the culinary tourist exists (Hall and Mitchell, 2005). Local coffee brands were the preferred type by respondents (53.7%) compared to international coffee brands (46.3%). Correlating with recent actions in Totnes (Kelly, 2012 - BBC News Magazine), this supports Schuiling and Kapferers' (2004) assessment that local brands are the leading competitor. It also suggests that local brands may endorse stronger consumption values posit by Sweeney and Soutar (2001) to explain consumer purchase behaviour. Dismissing assumptions made within the literature review that international branded coffee shops could be perceived best at delivering these values. Respondents reported they visit coffee shops predominately with friends (50.3%). Only 4.7% of respondents visited with work colleagues, suggesting escapism from daily routine by Iso-Ahola (1987) may explain why coffee shops are less likely to be visited with work colleagues, avoiding an association with work related activities. This sustains popular belief that coffee shops are a social activity, with behaviour socially influenced by friends or family (French and Raven, 1959). Note: a Likert Scale was used, rating 1-5 (1= weakest reason, 5= strongest reason). Analysis found that past experience/familiarity was the main reason why respondents were motivated to their chosen coffee shop (4.09). Confirming the influence of motivational push factors like familiarity and security (Swarbrooke and Horner, 1999), to satisfy expectations, meet private needs and wants (Pearce, 2005; Witt and Wright, 1992) and influence behaviour (Brand Social Power Theory, 2009; Busch, 1980; Crosno et al., 2009; French and Raven, 1958; Gaski, 1984a; Lippit et al., 1952; MacKenzie and Zaichkowsky, 1981; Warren, 1968, 1969). Confirming Brand Values are endorsed from personal experience with the brand subject (Bradley, 1995; Chernatony and McDonald, 1992; Clark, 1987; Doyle 1998; Jones, 1986; Tuominen, 1999), e.g. 'Attachment of place' (Phillips, 2013: 202), a principle Rowles (1978) and Smith (2009) claim is associated with exposure to a place. That Strong local identity rated the weakest (3.31) may suggest that local identity does not have the same impact as that of the brand itself, e.g. marketing advantage (Berry et al., 1988), enhanced success (Rooney, 1995) or active consumer behaviour (Assael, 1995; Meadows, 1983). This suggests that promoting local identity in coffee shops may not significantly affect customer behavioural intentions. A 1-5 Likert Scale was also used to identify what aspects were most important for both international coffee brands and local coffee brands, summarised in table 4 below. High quality of coffee/food was found the most important aspect (4.36) concerning international brands. Reinforcing perceived core service quality influenced existing customers (Butcher, 2005), similarly confirming Bao et al. (2011); Grewal et al. (1998) and Richardson (1994, 1996) that quality perception was most important for determining purchase. Rated second most important for an international brand was good reputation (4.08), confirming that social regard is a critical influencer (Butcher, 2005; Mattila, 2001). Friendly staff was rated most important for local brands (4.37). These findings are consistent with Bitner et al., (1990); Driver and Johnston (2001); Hall, (1993); Iacobucci and Ostrom, (1993) and Price and Arnould, (1999); who found friendly behaviours between service and customer enhance business success. High quality of coffee/food rated second most important, as mentioned above consistent with Butcher (2005) and Mattila (2001). Good atmosphere was also considered important for local coffee shops (4.13), supporting Kotler (1973) that atmosphere is often the primary product to effect purchase decision, physical surroundings and environment are also influential (Gardner, 1985; Obermiller and Bitner, 1984 and Donovan and Rossiter, 1982). Table 5 shows respondents' attitude towards recent news claims regarding tax avoidance (centered around Starbucks). The results below confirm that a significant number of respondents were affected by the story (34%), claiming they would avoid using international chains in the future. Though 53.3% of respondents said it would have no effect, an additional 12.7% stated they were unsure of their future intentions. This provides a case which represents how important brand equity (Aaker, 1991) is for building the product's image (Clearly, 1981), value promotion to attract and keep customers (Rooney, 1995), positive image (Ginden, 1993), consumer generated image (Chernatony and Dall'olmo Riley, 1998), brand value (Park et al., 1994) and likings and perceptions (Moore, 1993). Damage to the brand can be critical; the findings demonstrate how negative brand exposure against Starbucks now evokes a negative association and brand perception (Wanke, Herrmann and Schaffner, 2007). This confirms the power of Keller's Brand Equity Model (1993); brand knowledge can affect consumer response, suggesting it had hindered brand attitude (Tuominen, 1999; Yoo and Donthu, 2001). Brand reputation (Romeo, Weinberger, and Antes 1994; Siomkos and Malliaris 1992) is a feature affected by consumer response to company crisis (Jorgensen, 1996). Jorgensen (1996) and Weiner's model (1986) found the higher degree of responsibility and controllability a company was for said event the higher it elicit feelings of anger, effecting judgment, purchase and behaviour intentions (Jorgensen, 1994). The high number of respondents not affected could be explained using attitude strength, brand commitment and brand loyalty (Ahluwalia et al., 2000; Keller, 2003; Tuominen, 1999; Yoo and Donthu, 2001) i.e. brand equity (Aaker, 1991; 1992), confirming the importance of the Service Brand Relationship Model (Tsai, 2011). Cross Tabulation and Chi-Square Tests studied the relationship between independent variables and dependent variables to determine whether a significant association between two variables existed (Brunt, 2012). This research revealed a number of significant associations existed, providing insight of consumer behaviour to coffee shops, discussed below. This shows a significant association; women are more positively affected by servicescape (Gardener, 1985; Kotler, 1973; Obermiller and Bitner, 1984) and environment than men (Raajpoot et al., 2008). Popular and thriving maybe associated as busy, men are more negatively affected by waiting time than women (Grewal et al, 2003) which explains this gender association, suggesting Wight's (1997) avoidance of crowds to explain behaviour is more prevalent in men than in women. rated 'possible' highly. Most ages rate 'support local brand' highly as a motivator to chosen coffee shop, though the older you are the stronger this motivates you. Approving Boyne, Hall and Williams (2003) that community support to stimulate and revitalise the local economy exits. motivates you when choosing a coffee shop. Supporting Day et al. 's (2000) Minimizing Sensory Overstimulation Theory, as suggested by Phillips' (2013) study, older participants were startled by sudden, heavy or loud noises. 1977), which create consumer confidence (Assael, 1995) and active consumer behaviour (Assael, 1995; Crosno et al., 2009; Meadows, 1983). The cross tab indicated that somewhere new/different rated a high motivator among respondent, thus an influential factor in consumer coffee shop decisions. This is consistent to the framework created by Pearce and Caltabiano (1983) and Sharpley (2008) whom signify biological and social motives change over time. Social changes influence behaviour, i.e. consumer taste and style changes (Moutinho, 1987; Rooney, 1995) and social influences are motivators found by Dann (1977); Iso-Ahola (1987) and McIntosh and Goeldner (1990). The findings agree with Bearden and Etzel (1982) and Witt and Bruce (1972) that social security and social approval motivates human behaviour. A further test found a significant association existed between age and preferred coffee shop. The two youngest ages groups 15-24 and 25-44 were found to prefer international branded coffee shops more than local branded coffee shops, supporting Key Note (2012), compared to the two oldest age groups 45-64 and 65+, which found a higher preference for local brands. Reviewing this exploratory study, we suggest that consumer motivations to branded coffee shops are influenced by the following three factors: past experience/familiarity, convenience of location, and friends and family. This research reveals that social influence is a strong motivator in consumer choice and purchasing behaviours to branded coffee shops. This research also identified some similarities between factors perceived most important from the consumer perspective for local and international coffee brands. The most important factors for a local coffee brand were, in order, friendly staff, high quality of coffee and food and good atmosphere. Whereas the most important factors for an international coffee brand were, in order, high quality of coffee and food, good reputation and friendly staff. Respondents indicated high quality coffee and food and friendly staff were important for both branded coffee shops. The results of this research exposes that a difference between coffee brand preference and influential factors exists. The following section presents practical implications for businesses or individuals within the branded coffee shop industry. This research identified that a strong liking for coffee shops exists, with local brands the preferred coffee brand choice. The difference between important factors suggests it contributes and influences consumer coffee brand preference, motivations and behaviours. So to understand the motivational reasons behind consumer choices in branded coffee shops the consideration of these factors is necessary. Differentiating the local brand from the international brand, the results suggest local brands endorse a more personal relationship compared to the professional, quality relationship found from international brands. These findings provide additional theory on the power of social influence from the consumer and business perspective as a motivator to branded coffee shops, i.e. perceptions and social brand power. In addition, this research reveals that significant associations did exist between motivation and social demographics such as age and gender; e.g. women were more motivated by the popular and thriving atmosphere of the branded coffee shop than men. Whereas age presented larger differences between motivations e.g. 'support local brand', 'avoid crowds/noise', 'somewhere new/different' and 'brand and reputation'. This research could be used for coffee shop businesses seeking to target a specific audience. 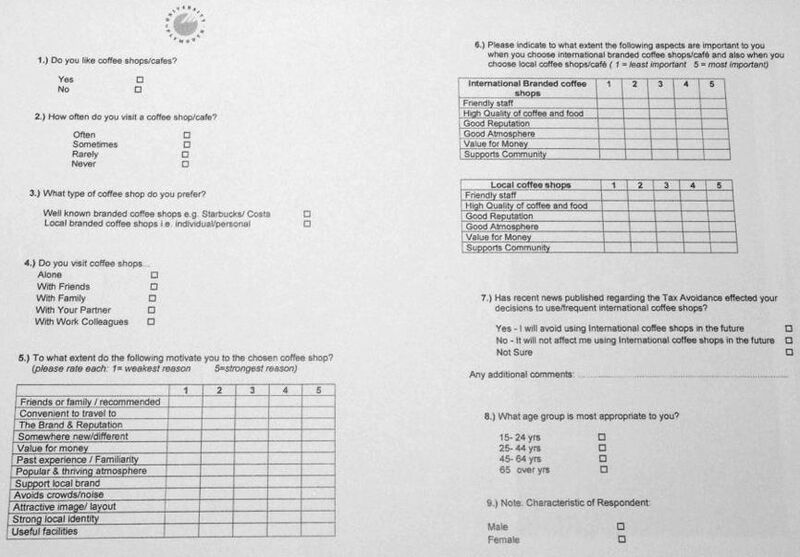 Regarding tax avoidance, results from a specific question (see appendix 2, Question 7 and table 5) illustrated that consumer attitude was affected and that it negatively influenced future decisions, motivations and behaviours towards all internationally branded coffee shops, especially Starbucks itself. Detrimental to the brand reputation, this draws attention to the importance of maintaining a good reputation for successful coffee shop businesses. The findings suggest theories and literature on brands, motivation and influential factors is applicable to branded coffee shops, e.g. theory concerning local brands as leading competitors endorsing qualities and traits superior to those of international brands. Quality perception is important for determining brand purchase and can explain consumer behaviour to branded coffee shops. This research addresses the gap that exists within literature concerning branded coffee shops, especially regarding local brands and their ability to influence consumer perceptions. Little research explores what factors influence customer behaviour, perceptions and motivations to local and international branded coffee shops in the UK, therefore this research creates a foundation for others to explore and develop further. Given the rise in interest and boom of the coffee shop industry in recent times, this provides market research consideration for new start ups in the tourism and beverage industry in the future. A multi methods approach using an in-depth interview could improve understanding and explore customer attitudes further. A comparison of consumer preferences across different countries could also reveal whether cultural differences influence decisions. Limitations to this study exist, e.g. the sample selection was taken from the South West and South Wales and other UK regions were not explored, meaning a holistic mix of social demographic across the UK is not confirmed. Likewise, an equal count for each age group and gender was not achieved. A larger study may discover a difference between gender and preference of branded coffee shop, or whether significant associations exist between age and importance of aspects, which chi-square tests in this study could not validate due an insufficient sample size. Clearly the results demonstrate coffee shops are an integral part of popular British culture and this research presents findings to support this theory. I would like to take this opportunity to express my profound gratitude and appreciation to my guide, Professor Rong Huang, for her exemplary guidance, monitoring, constant encouragement and kindness. Her support and time has been invaluable and inspiring throughout the development of this article. I would also like to take this opportunity to thank Professor Graham Busby for the valuable information provided by him in his respective field. I am grateful for his support. Lastly, I would like to thank my parents, brother and friends for their constant encouragement, support, care and kindness throughout this entire process. Legitimate power is based on the perception of an individual that another person has the legitimate right to influence him or her, and that he or she is obligated to accept the influence. Reward power is based on the perception of an individual that another person has the ability to reward him or her. Coercive power is based on the perception of an individual that another person has the ability to punish him or her. Expert power is based on the perception of an individual that another person has some specialized knowledge or expertise. Referent power is based on an individual's identification with, and desire to be similar to, another person. 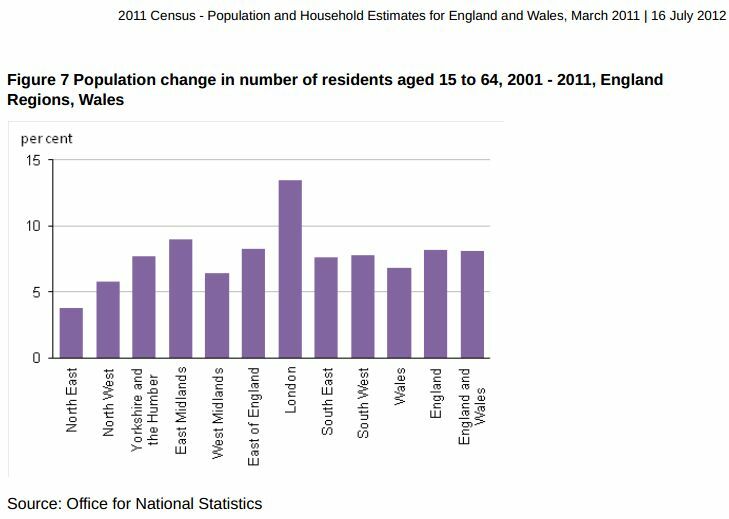 Table 6: 2011 Census - The populations for English Regions and Wales (Office for National Statistics, 2011:22). Sophie Burge has recently been awarded a First Class BSc Honours Degree in Business and Tourism at the University of Plymouth. Sophie is now looking to pursue her career around the world. To cite this paper please use the following details: Burge, S. (2013), 'The motivational reasons behind consumer choice in branded coffee shops', Reinvention: an International Journal of Undergraduate Research, BCUR/ICUR 2013 Special Issue, http://www.warwick.ac.uk/reinventionjournal/issues/bcur2013specialissue/burge/. Date accessed [insert date]. If you cite this article or use it in any teaching or other related activities please let us know by e-mailing us at Reinventionjournal at warwick dot ac dot uk.